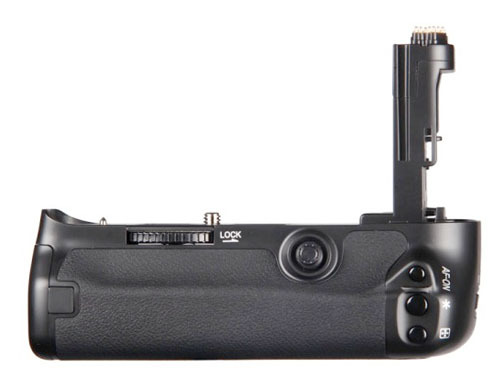 The Canon BG-E11 Battery Grip is compatible with the Canon 5D Mark III. You have the option of using a single or two LP-E6 batteries or 6 AA batteries by using the magazine. A third option for extended, un-interrupted shooting when electricity is available is with the AC Adapter kit ACK-E6. As expected the battery grip has a place to hold your battery door cover so that it doesn't get lost while you are using your grip. One of the unique features of this grip is its magnesium alloy construction instead of the usual plastic material. 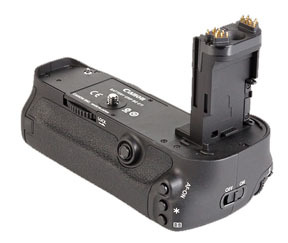 Canon also made this a side-loader for inserting the batteries, again an improvement over the rear-end entry method. Some people prefer the back-door method because it's a real quick one-handed operation to change just one battery. The side door method requires a little more effort to slide out the magazine, replace a battery (or two) and slide the BGM-E11L magazine back in again. When you pay this much for a camera accessory you want it to feel rock-solid. When you hold the Canon BG-E11 in your hand, your palm rests against solid metal now and it feels secure. If you are very conscious of the weight you carry with you when you are an on-the-go photographer, you may not think of a battery grip as one of the best canon camera accessories to have. Just about everyone who buys one decides to keep it on the camera at all times. Like anything else it takes a short time to get accustomed to the different feel and function. Then you will feel as if your Mark III is incomplete without it. 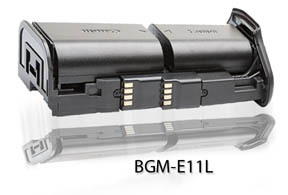 Here is the BGM-E11L magazine that holds two LP-E6 batteries. Super serious shooters will purchase an extra magazine and have it loaded with two fresh batteries. An interesting but less popular Canon camera accessory. A power adapter gives you a third power option. It's good for inside studio shooting and eliminates the need for any batteries at all. You can the photo below of the Canon ACK-E6 adapter. The battery shaped insert will slide into the camera just as a regular LP-E6 battery would. The biggest downside is you've got a cord coming off the camera and plugged into an outlet. The AC adapter works with the Canon EOS 60, 5D Mark II, Mark III and the 7D. Here is a 5 minute video showing an un-boxing of a new BG-E11 and the connection to a Canon 5D Mark iii. 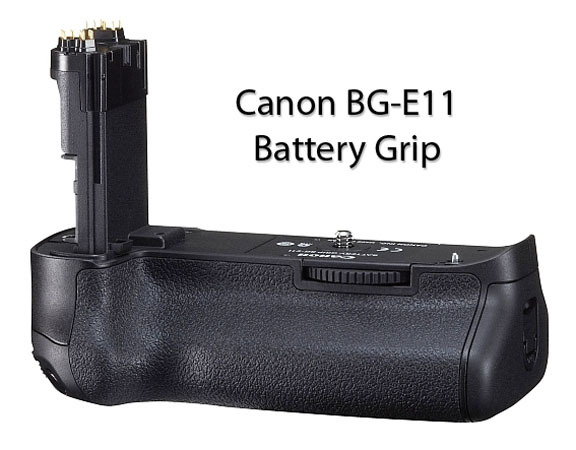 Enjoy shooting with your Canon BG-E11 Battery Grip! Shoot more photos. Watch less TV. Another one of the vital accessories to consider for advanced photography is a Canon Speedlite. If you already have a professional flash gun you may not need a speedlite. If you don't already have an accessory flash, you might consider it. 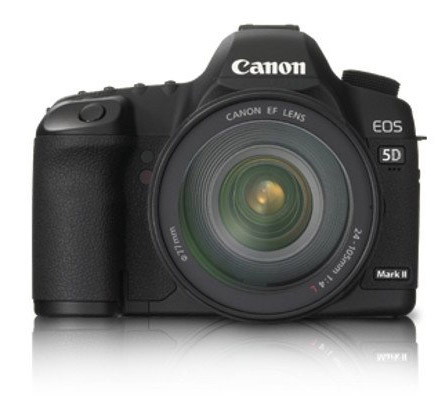 The Canon 5D Mark III has no pop-up flash. 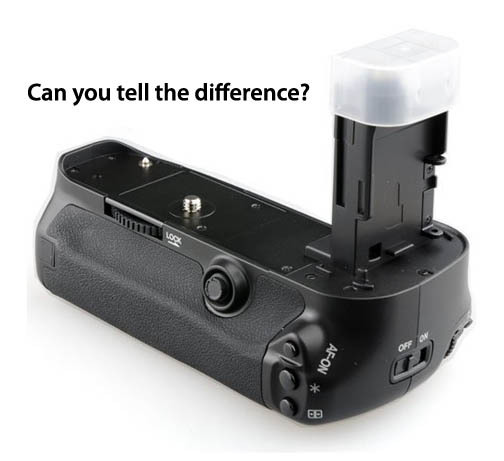 It should be a priority to get a speedlite or alternative. 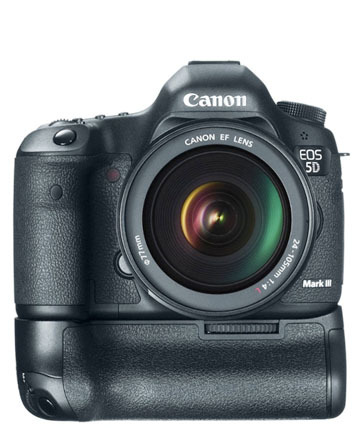 In any case, you may also be interested in reading this: Best Canon Speedlites.